"As an Autogeek employee, I love detailing and making sure my car is sparkling clean however I don�t have the time to wax my car every few weeks. Thanks to Wolfgang Uber Ceramic Coating this is no longer an issue, as in just a few hours you can have your car protected for up to three years. In addition to longevity and jaw-dropping look of the coating, your car will also have anti-static properties that help to keep the vehicle clean in-between washes. My Wolfgang Clean, Coat & Maintain Kit has everything you need to take your car from a filthy mess, to a squeaky-clean show-stopper without needing to set aside the time for a monthly wax job. These products are simple and easy to use, meaning that anyone can achieve phenomenal results for years to come." 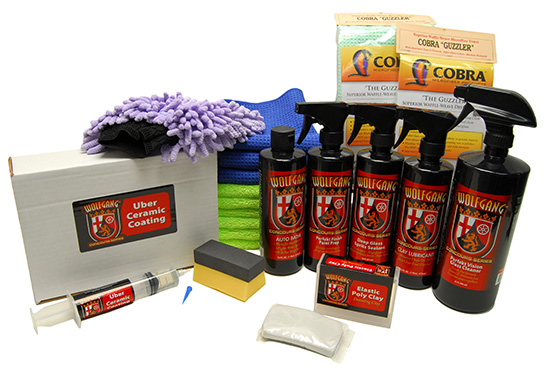 Apply the Wolfgang Uber Ceramic Coating, following the directions on the packaging. "At this point your car is protected for the next few years! To maintain the coating simply wash the car with Wolfgang Auto Bathe. Heading to a car show and looking to amp up the gloss on the paint? No problem, simply spray on and wipe off the Wolfgang Deep Gloss Spritz Sealant. It�s that easy!" Wolfgang Uber Ceramic Coating provides protection measured in years, not weeks or months. This easy-to-apply coating was designed for painted surfaces, glass, wheels, head lights, and hard exterior plastic trim. It�s packaged in a syringe for easy application. Uber Ceramic Coating lasts up to 3 years on painted surfaces, 2 years on wheels and 1 year on glass. It offers protection without compromise. And the shine, it must be seen to believe. �A single 15cc syringe will coat up to�3 midsize cars�with protection that is unrivaled by a wax or paint sealant. Wolfgang Perfekt Finish Paint Prep is a powerful cleaner that removes unwanted polishing oils, finger prints, fillers, and silicone oils from freshly polished surfaces. What�s the importance of removing the aforementioned contaminants before waxing, sealing, or coating your vehicle? Simply put, the cleaner the surface, the better your wax, sealant, or coating will adhere. This critical step is especially important when applying Wolfgang Uber Ceramic Coating, a resin-based surface coating that will only adhere to surfaces that have been first pre-treated with Perfekt Finish Paint Prep. Wolfgang Deep Gloss Spritz Sealant is a true polymer paint sealant spray that protects and shines in one quick step. Liquid crystalline polymers coat the paint in incredible gloss and protection � just like a conventional sealant. Yet, Wolfgang Deep Gloss Spritz Sealant takes just minutes to apply. Give your vehicle a spritz of shine with Wolfgang Deep Gloss Spritz Sealant. This spray-on sealant is a revolution in paint protection! Wolfgang Deep Gloss Spritz Sealant is a direct descendant of our ground-breaking wipe-on sealant, Wolfgang Deep Gloss Paint Sealant. The two share virtually the same blueprint, with one exception. Deep Gloss Spritz Sealant has engineered liquefied polymers that disperse easily through the spray nozzle and then cross-link on the paint surface to form one solid polymer coat over the paint finish. Auto Bathe, Wolfgang�s state-of-the-art car wash, is a natural and gentle yet very effective, non-toxic, biodegradable cleanser. It surpasses other similar products in cleansing power and preservation of your car�s surface. This concentrated shampoo gel is built around TUFF SUDS II, foam that suspends natural oils and German �super polymers� within each bubble�allowing built-up dirt and grime to be effortlessly swiped away. Wolfgang Auto Bathe leaves behind an ultra-thin coat of gloss resulting in a beautiful shine. Wolfgang Perfekt Vision Glass Cleaner relies on advanced chemistry instead of inexpensive, high-octane cleaners. Don�t be fooled though, this intense cleaner is strong enough to cut through the tough stuff, including fresh water spots, vinyl fogging, grease, grime, and even smoker�s film! What�s more, Perfekt Vision Glass Cleaner imparts a hydrophobic coating that causes water to bead up and be whisked off the glass at speeds in excess of 30 mph, improving safety by increasing visibility in wet-weather conditions. Wolfgang Clay Lubricant works hand in hand with Wolfgang Elastic Poly Clay to give your vehicle the cleanest possible finish. Wolfgang Clay Lubricant protects the paint during the detailing clay process with a super slippery layer of polymers and wetting agents. The clay glides easily without scratching. When you�re finished claying, use Wolfgang Clay Lubricant to wipe away any residue left by the clay. Wolfgang Clay Lubricant leaves no residue. The Elite Microfiber Towels with Absorbent Banding represents a breakthrough in microfiber technology! These specially constructed microfiber towels were designed to gently buff off liquid waxes, paste waxes, compounds, polishes and sealants without instilling swirl marks or leaving pesky lint behind. The 75/25 blend of polyester and polyamide is the perfect balance of plushness and tightly knit design, making the towel perfect for buffing off stubborn compounds and polishes. The silk banding around the towel is absorbent as well, increasing the towel�s ability to evenly distribute quick detail sprays and spray waxes without creating streaks. The Guzzler features a plush, 80/20 waffle weave that increases its surface area for greater moisture absorption. The towel can absorb 7 times its own weight in water! In fact, this towel is 20% plusher than our other waffle weave towels to give it even an even greater capacity for moisture! It will not scratch any surface and it has a magnetic charge that attracts lint and dirt. This towel will leave the inside and the outside of your vehicle spotless! Total retail value of $362.88. You save $87.88!